This is an active / passive exercise. If the sentence is passive, the students must write an active one and vice versa. 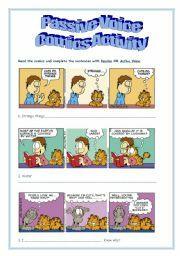 Again, Garfield is always welcome to my students. Hope you like it. I edited my first worksheet here. Hope you like it and thank you for all! 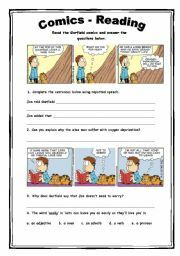 Some Garfield reading activities my students liked. 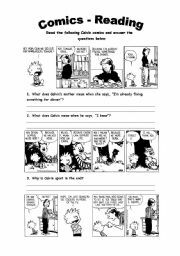 Whenever I prepare a test I add one or two questions with comics. My students always love them. 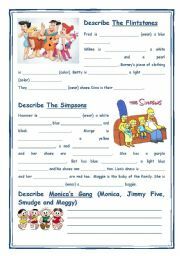 Hope you like this worksheet. Some comics reading activities. I hope you like them. It´s a cool activity to work with present continuous and clothes. It may be assigned as homework as well. 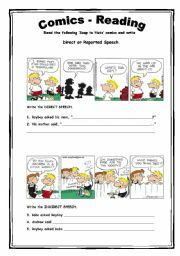 Direct and Reported Speech with ANSWERS. Hope you like it! Good for introducing or reviewing ability. I also like the animated gifs. I put some exercises with answers. Hope you like it! This ppt can be used either to introduce or to review the Future Continuous and the Future Perfect Continuous. I hope it is useful for you. Good for introducing or reviewing NOMINAL CLAUSES. I put some exercises with answers. Hope you like it! 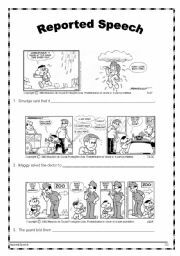 The Future: Simple Future - will; Going to; Present Continuous; Simple Present and the modals may and might. 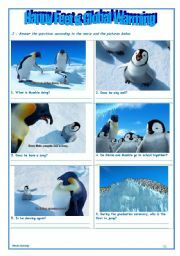 Most of the pictures are animated. My students liked it a lot. I hope it is useful.